Nobody wants to regret after renovation work completed. Surely you also want to satisfy with the house renovation, and are dreaming your new life style. If you know the simple step, your house renovation will succeed without fail. STEP1. Planning for your dream house. You need to plan in detail as much as possible. If you are planning a brief only, house renovation would proceed by the convenience of the contractor. It is also a good way to ask the architect / interior designers. STEP2. Choose the renovation contractor. Choosing a renovation contractor has a significant impact on the success or failure of the house renovation. Gather information on contractors, discern contractor that is suitable to your renovation, and compare the quotations by get competitive quotes from multiple contractors. STEP3. Have a meeting with the renovation contractor. There is a lack of meeting as part of the main causes of regret to renovation. Monitoring of construction has a significant impact on the success or failure of the house renovation. STEP4. Check the quotation / agreement. You should examine the renovation content than the price. The quotations are not written in detail about the renovation work in many cases. You need to check the contents to renovation contractors. In a lot of renovation work, There is not a person to supervise the construction. In order not to regret, you will need to monitor by yourself, or to ask construction supervision to an external company. Some contractors may not properly clean. You need to check the construction waste and cleaning upon completion of construction. If you find construction defects after the completed the renovation work, the contractor would repair by free of charge. You should also to check the warranty of house renovation. I wish you success in your house renovation. Surely wonderful lifestyle is waiting for you. We were asked from a customer why interior design of rehabilitation centers cannot be felt an HOPE. And we answered as follows. Perhaps, we think the questioner was thinking in stereotypes that rehabilitation centers must be designed by “HOPE”. But, many rehabilitation centers are not designed with the concept of “HOPE” as the questioner think. In many cases, it has been designed with the concept of “Charity” and “Kindness”. Therefore, the questioner does not feel “HOPE” from rehabilitation centers. In other words, the questioner is receiving feelings from the interior design sensitively. Designer IYONA will design charity and kindness as part of the HOPE. And, IYONA will design about “HOPE”. There are three thinking to design a “HOPE”. 1. Appeal to “HOPE” directly visually. 2. Induce spontaneous feelings to the users. 3. Design as the concept of “HOPE”. Many rehabilitation centers have been designed as a concept of “HOPE”. But, Designer IYONA is pursuing 1 and 2 of above. Interior Design takes up a lot of visual elements. However, Interior Design is not designed only by the visual elements. Interior Design that has been put feelings affects to the mind through the five senses of the users. It induces feelings by to resonate with users’ emotion casually. That is, Interior Design is not only to design by the know-how and techniques preferentially. It is important to express by designer’s sensitivity and intention that the designer want to give. And, Interior Design must be design to induce positive emotions as “HOPE” without users conscious. Designer is thinking about how to express for that. Shower is effective to refresh yourself when you are tired with the work. There is a shower that evolved a shower for the home. You can take a shower lying down. The shower can control temperature, intensity and quantity of water. This shower is not only to refresh you, but create a relaxing space. The shower has pre-programmed setting and you can decide from among balancing, energizing or de-stressing effects. The balancing setting has the effect as caressing your body by a hand softly. The energizing setting has the effect as stimulate your body and liven your mind. The de-stressing setting has the effect as getting rid of the stress and to regain flexibility of the muscle. HORIZONTAL SHOWER of Dornbracht is a new type of shower. you can get relaxing time at home as in the spa. Limited Offer For Renewal Open. First Design Free Of Charge. The left photo is a kitchen that is decorated with tiles. At first glance, the kitchen renovation work is completed without problems. In fact, at the time of renovation has been completed does not appear to be a problem. According to the house owner, Tiles of kitchen is peeling off in the 6 months after the completion of construction. The photo on the left is just lifted up the tiles peeled off by hand. Tile has been completely separated from the concrete frame of the kitchen. Photo on the left have just zoomed. And it can be seen well that the tiles has completely peeled off from mortar. we can not see clearly in the photo taken by distance. but the photo taken by near can be seen the finishing of the kitchen renovation. the finishing is not very good as you also noticed. In general, the lifespan of the construction tiles are an average of 13 years in direct sunlight. 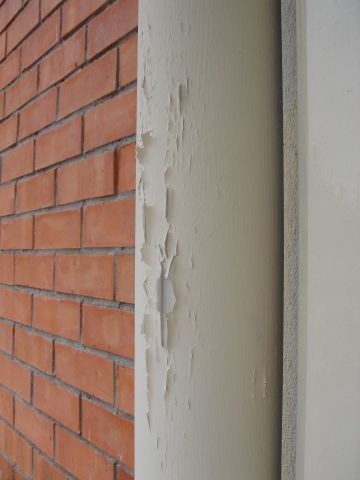 Cause of the peeling tiles at the direct sunlight are repeated stress of expansion and contraction due to temperature change occurs at the surface by solar radiation and cooling. However, In the case of renovation of the photo, It is low possibility due to temperature change because it does not exposed to direct sunlight. For the tiles and mortar were not adhere closely. Therefore, the tiles was peeling by the penetration of water between the tiles and mortar by capillary action. The kitchen tiles are peeling in six months without exposed to direct sunlight. This is considered poor construction work obviously. In this case, The peeling of the tile could be multiple factors, such as the followings. Processing the back of the tile. Adhesion of impurities to the back of the tile. Pressure of trowel for applying mortar. Time of keeping of the mortar after mixing. Timing to adjust the joint of tiles. Effect on quality through craftsmanship will be the No.5 and No.8 in these. Others is due to the knowledge of renovation contructor and due to consideration for customer. We are committed always to improving the skills and knowledge of the house renovation without satisfied with the current technique. We do not want a lot of people to be made to regret for a renovation by such a contractor in the above photos. We would like to help to improve more your life. Therefore, We listen to your dissatisfactions and your requests about your home, not to impose to you the ease of renovation work due to selfish of renovation contractors. We will provide a confortable house renovation for you over a long-term. And, If it occurs renovation defect obviously in such a short time, we will repair free of charge. Are you interested in our tile work for your house renovation? This photo is the hand-held bidet mounted in the toilet by a renovation contractor. Maybe you feel uncomfortable, but you might not notice what the problems clearly. Please see the next picture. This photo is changed the direction of the hand-held bidet and written lines. You can find that the bracket of hand-held bidet is mounted with a large angle of inclined on the wall. There is no special reason that the hand-held bidet mounted with an angle. Judging from these facts so far, this renovation contractor is not aware that they work for customers. This may not be a practical problem. But, such a careless renovation gives residents mental-stress unconsciously. Accumulation of small stress brings slumps to your health, life and business. To make matters worse, If people do not care any longer about the condition that is not normal, the sensitivity and the common sense will be lost. Please try to imagine, your kids think that abnormal, senseless, or problem is normal condition to your kids. Inability to judge right and wrong is terrible. The renovation cost is no different depending on whether straight or inclined. For the sake of your kids, please choose the renovation contractor who thinks about you and your family’s life. Why House Window is Dirty by Bird Droppings? A window of the house does not become dirty usually by bird droppings because there are eaves above a window. But why would that happen improbable. It happens because a renovation contractor makes high priority on the workability more than the residents living. The result of that, the resident cannot always open the window to avoid dirty by bird droppings. Lack of the knowledge or awareness of a renovation contractor make dirty something. Perhaps, such renovation contractors may say not to relate bird behaviour and renovation. However, If a renovation contractor laid a pipe above a window with some reason, a window is always dirty with birds droppings by birds perching on the pipe. The window frames and glass need not be dirty. Condition of a window is always dirty will give you a mental stress unconsciously. Unnatural condition is not good for you. Anyway, if renovation contractors have just a little careful, the problem never happened. Behaviours of birds is not responsible on a renovation contractor, but a renovation contractor who always cares about natural providence, make a comfortable home to live for you. you can find the house renovation service. The floor tiles in your home may be covered with scratches and cracks by house renovation. In the worst case, it may break. The floor tiles damage often occurs when you leave the original tiles in house renovation without re-covering new tiles. Sometimes, the new floor tiles is covered with scratches. This is the reason in Malaysia what many of the renovation contractors consider the floor tiles damage is natural during construction. However, It is possible the original floor tiles keep beautiful without damage. In many other countries, this is common sense. Furthermore, it is possible in Malaysia of course. If the renovation contractor always considers why you want to renovation house, they never damage original house condition. This is not related to renovation skill. This is the difference in the consciousness. You never request that the floor tiles covered with scratches. don’t you? Please tell your renovation contractor the floor tiles keep beautiful and do not damage. They would have a little to worry about. Check this house renovation service. This photo is 2 months later after painted the downpipe. The paint surface is a clean state without dirt. However, the paint is peeling in only 2 months. Perhaps, the renovation contractor will make an excuse that peeling is because of the low quality of the paint. Really, Is the paint low-quality? The paints have been used mainly Nippon Paint, Dulux and JOTUN in Malaysia. There are other paint manufacturers. Many construction and renovation contractor is using these paints. These paint manufactures are investing huge cost and time to develop the paint. Since many years, the paint manufactures have developed the paint for various applications, has large expertise in the paint. Why inexperienced renovation contractors compared to the paint manufactures can say bad quality of the paint? If the renovation contractor is familiar with the paint, the renovation contractor should know problem before painting. If the renovation contractor is not aware of the problems before painting, renovation contractor knowledge is poor. Even amateurs can paint, but high quality paint work requires thorough knowledge not only experience. You must choose a renovation contractor and/or house painter carefully. The renovation service is available now in Penang! Welcome the designs of other companies also to estimate your renovation cost. What did you fail in renovation? Please tell us the failure and dissatisfaction to your renovation contractor. Your reviews will help to improve the quality and the services of renovation industry. Copyright © 2011. HouseRenovation-KL.com All Rights Reserved.